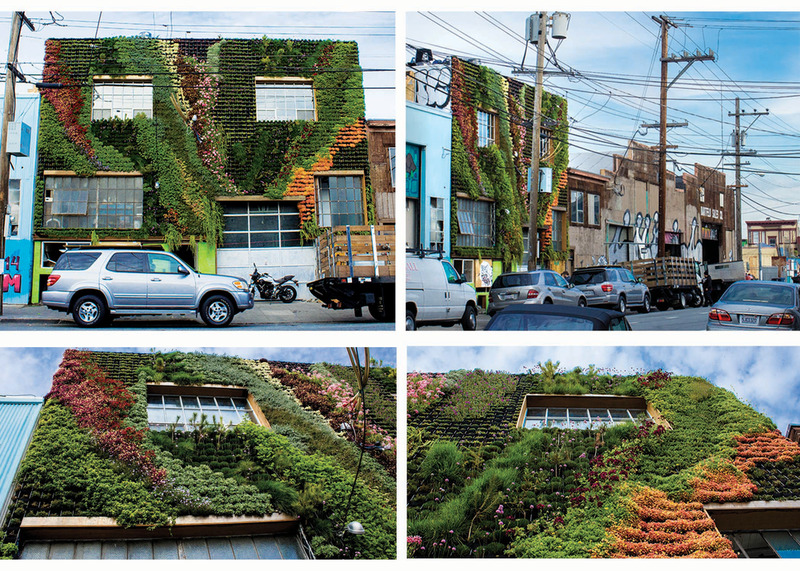 Partners in design: Amanda and Brandon Pruett from Living Green Design co-created this living wall in San Francisco’s Mission District, turning a sterile heat island into a thriving green oasis. Did you know? 70% of the detoxing our bodies need is supplied by breathing (perspiration provides 20%). And yet, dangerous volatile organic compounds released by carpets, copiers, and most any synthetic item in our lives rob us of clean air daily! Florafelt Recirc 32-Pocket Plant Tower by Rainforest Plants for Trifacta San Francisco. With all those hazardous compounds and carbon dioxide hanging around, Amanda creates living walls that work hard to remove ammonia, benzene, formaldehyde, and other toxins from the home and workplace. Thanks to photosynthesis, plants also replace toxins with vital oxygen. Amanda created her first vertical garden while working for Cradle to Cradle Products Innovation Institute, helping companies such as Aveda design products for a sustainable economy. Last March, she “took a leap” and started her own business bringing walls to life. She started with an 8x4-foot mobile vertical garden for the Natural Products Expo in Anaheim, CA, then installed it in her client's office in Palo Alto, CA. Now her creativity knows no bounds. With her unique custom portable gardens, Amanda is tapping into, and ramping up, the market for living wall rentals – weddings, conferences, photo booths and more. Because these gardens need backlighting, company logos and other special touches, Amanda turns to a whole community of artistans to bring out the best in her projects. As a ceramic artist and industrial designer who created a “living desk” for her college thesis, perhaps it’s only natural. “I enjoy the collaborative spirit. It inspires and invigorates me," she says. Amanda often works with clients whose spaces are short on natural light, so she creates walls composed with maintenance-free mosses that stand up to low light. The mosses are preserved, having lived once, so they still provide an eye-catching way to spotlight a firm’s eco-credentials while setting it apart from the crowd. Amanda says she’s happy with the ease and flexibility of Plants On Walls‘ Florafelt system. “You can put plants in, then exchange them for a different aesthetic as your style changes." How much is enough? For a 1,800 square foot house, a NASA study recommends 15 to 18 good-sized plants that clean the air and give off oxygen. Air-scrubbing low-light tropicals vertical garden by Amanda Goldberg Planted Design. Older PostAnnmarie Gianni's Moss Wall Installation "This Green Wall Doesn’t Need to Be Watered (Here’s Why…)"